The YumaPro programs all use the same centralized YANG language parser. The complete YANG language is supported, as defined in RFC 6020 and RFC 7950 (for YANG v1.1). The file naming conventions defined in this specification must be used, along with all the language definition rules. Definitions can be contained in modules and/or sub-modules. Any number of revisions of a module or submodule can be used concurrently, The import-by-revision and include by-revision features of YANG are fully supported. The YANG language includes many ways to specify conditions for database validity, which traditionally are only documented in DESCRIPTION clauses. 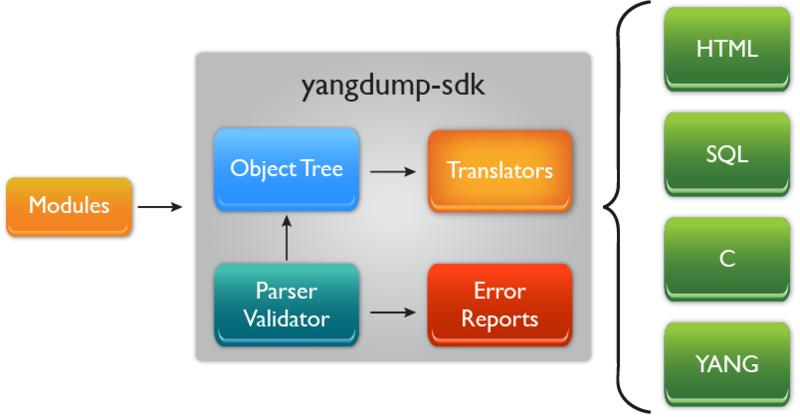 The YANG language allows vendors and even data modelers to add new statements to the standard syntax, in a way that allows all tools to skip extension statements that they do not understand. All extension usage within YANG files is supported and saved. The application data is available to all YumaPro programs, including netconfd-pro server instrumentation. Note: The smidump is not part of YumaPro, but it can be utilized to convert MIB modules written in SMIv2 into YANG modules, which can then be implemented in netconfd-pro, and managed with yangcli-pro. The freely available libsmi library contains the smidump program.